Set at the foot of a mighty peak, the Sun Wukong slot machine from Playtech is a stylish, Eastern-themed game with a large top jackpot and a potentially lucrative bonus feature. The symbols have been well-designed, even if my own cultural ignorance prohibits my ability to appreciate their significance – the gangster-looking pig man is one such example. The game itself is played across 15 win lines over five reels and three rows. 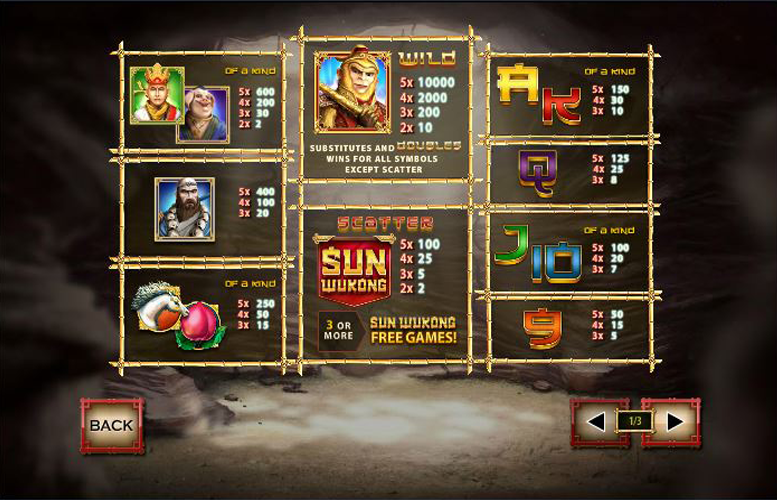 The main feature of Sun Wukong is that it gives players the opportunity to select exactly which bonus mode they play every time it is triggered. On offer is a lot of spins with a low multiplier, a few spins with a high multiplier, and an average of the two. Competitive main game jackpot. With a top prize of 10,000x the line bet, hitting the highest five-of-a-kind combination during a 5x multiplier could result in some seriously large prizes. Nice art style and music – well-designed backgrounds and symbols compliment the game’s feel. Potentially lucrative bonus stage. Free spins are always great. 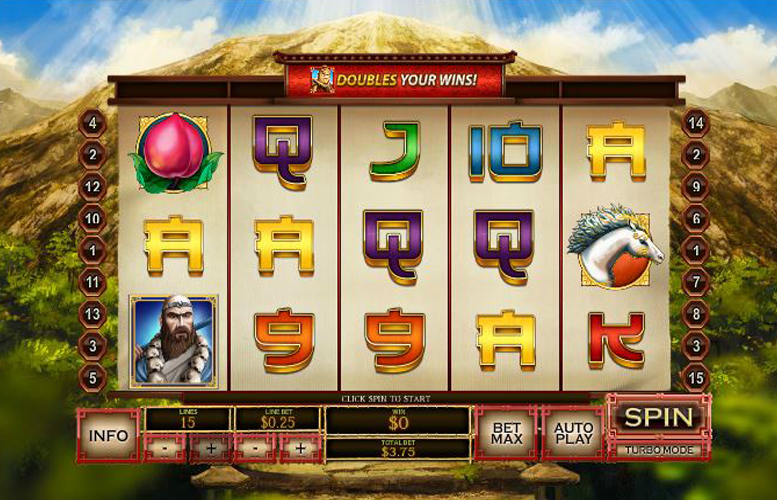 Free spins with large multipliers are even better. Just one bonus round. Although it’s a good one, the lack of additional features could limit a player’s enjoyment after multiple sessions. The ability to choose which type of free spins are played does negate this, however. No animation during play. With such strange looking characters on the symbols a bit of animation when they form part of a win line would be a nice addition. “Wild” Monkey warrior = 10,000x the line bet. Pig man, or man with head dress and green background = 600x the line bet. Warrior with blue background = 400x the line bet. Horse, or Lotus = 250x the line bet. Whilst there is only one standard game feature on Sun Wukong, it is a potentially lucrative one. We’re always fans of free spin bonuses, particularly so when they’ve a juicy multiplier applied. Landing three or more game logo “scatter” symbols anywhere on the board off a single spin will trigger one of three free game modes each with a different number of spins and a different sized multiplier. 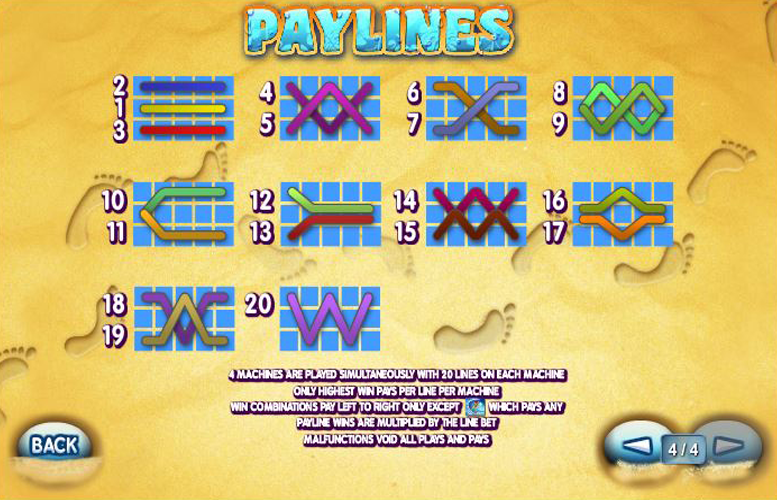 The first is called “Valley of the Sun” and is 20 free games with a 2x multiplier. Next is “Mountain of Fruit and Flowers” and is 10 free games with a 4x multiplier. Finally, comes “Kingdom of Heaven”. Here players will receive eight free game with a 5x multiplier. Ace or King = 150x the line bet. Queen = 125x the line bet. Jack or 10 = 100x the line bet. 9 = 50x the line bet. 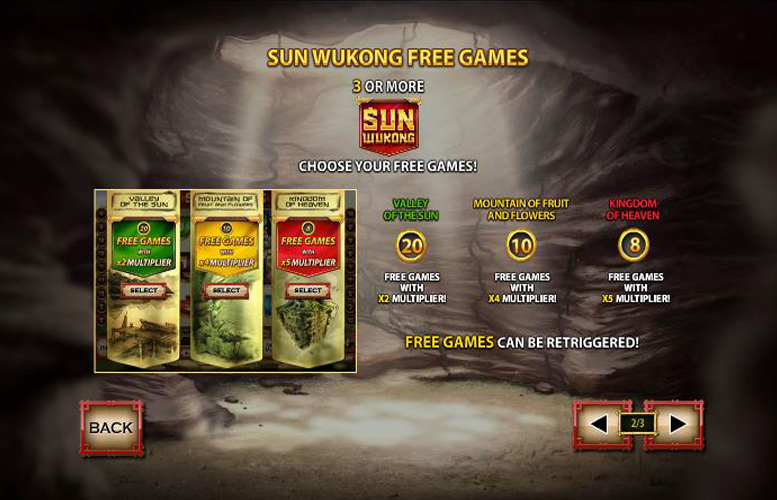 Players can vary their betting sizes up with ease on the Sun Wukong slot machine. They can adjust the number of win lines played between one and 15, and can bet between 1p and £75 on each. This means that the lowest possible bet per spin is just 1p and the highest is an impressive £1,125. With such a spread between maximum and minimum, this title certainly caters for all possible bankrolls. All told, it doesn’t matter that most Western players will have no idea what tale Sun Wukong is referring to. It’s a game that plays well, looks good, and has the potential to drop some massive prizes. Giving players the option to play different bonus features every time they trigger the stage is a nice inclusion and certainly adds to the game’s replay value. If there was some symbol animation and perhaps a second bonus stage this slot would be one of our top picks out there. Even without these inclusions, it’s a solid effort from Playtech for sure. This game has a rating of 7 / 5 with 509 total reviews by the users.